Today is the day. The scooter is up and running and I have even been scooting to base one for meetings and to the beach for a dip yesterday. I love each and every message from home and photos of your babies in costume. I love hearing about apple picking and cool weather. It is hot here. I find myself inadvertently applying deodorant before crawling into bed. I have a meeting in 30 minutes to make final arrangements for the Grand Opening today. We will start classes tomorrow! The scooter is pure junk, but it is now my pure junk. I ran into the shop owner yesterday and he asked about it and I was quick to tell him that it was not even running. He has offered to send over a mechanic. But the shop closes in the afternoon and I am waiting on them to reopen at 2:30 before calling. I remember when shops in Hartwell would close on Wednesday afternoons. Or maybe that is just the bank. Entire cities in France shut down for months on holiday and whole towns across every continent take afternoon siesta’s, but I am still not used to it. Nor am I quite used to snot rockets or picking your nose in public, but some things are good to be left to ones own cultural beliefs and/or social norms. I am also not used to not having internet. I don’t know how I ever lived life or got a complete K-12 education without it, but I did. Here, it is slow to non-existent. There are certain “hotspots” on the base that still remain illusive. All this is to say, if you don’t hear from me, it is because I can’t get online. Even this message I will write in advance and simply cut and paste when the wind seems to be blowing just the right way. I said goodbye to Robin this week and it broke my heart. I loved having a mom here to just sit with me, offer advice, take a good hard look around and encourage me in spite of it all. And sew curtains. And make me French Toast! Mom’s are great. Robin came just for me and endured the rough life here just for me. I will never forget the huge sacrifice she made. She and her husband, for giving her to me for three weeks. It was a priceless, selfless gift and I pray rich blessings over you both for what you did for me. This would have been a very hard three weeks without a familiar face. I really can’t even talk about it. (lump in throat). Let’s talk about something else. To all my donors I want to again say thank you. I was able to come here and get what I need and still have money left over. I was able to buy the scooter for transportation and my driver’s license and license plate a good stock of overpriced groceries and a desk and storage bins for my things. I am anxious to get started and teach 70 children in Africa to say y’all. I could not get to live this dream without you. I am blown away by your generosity and faithful support. I wish you all could be here to see it unfold. I will do my best, internet permitting, to keep you up to date, informed and hopefully, entertained. This whole place comes alive when the sun comes up. At the crack of dawn is already rush hour here. I awaken to sounds of children running off to breakfast and then school, employees showing up for work. A carpenter knocked on my door at 7:30 raring to go. I let him in and showed him what needed to be done and paid him to come back in 30 minutes to put a rod under the sink to cover all the rubbish, refuse and water bins. I waited and waited and had plans to go pick up the furniture at 9. He never showed, so I went to the transportation office and waited some more. I was told to wait for Joe and I did that for an hour and then told I was just waiting on some paperwork and waited a bit more. Steve and Cassandra showed up because the whole entire cellphone world in the whole entire country was evidently not working. mcel was completely down and still is. Can you imagine? If all of AT&T just didn’t work for a whole day? I heard not one complaint, other than my own. Finally, at 11 we were off. We had to stop and get gas and we all piled out as we do around here and went in the gas station for a drink. We all got a Ceres Litchi juice for $1 and some off brand Fig Newtons. We drove to the furniture place named Maxara (Mashara) but had then decided we were in the area where our friend had told us we could get a motorcycle driver’s license. We are in desperate need of a car, but don’t have $15,000, so we are considering a scooter. Steve wants us to get a motorcycle because it is cooler but the girls have veto power. I hate motorcycles. I think it comes from the horrific burn I got from the exhausted as a little girl at Papa Davis’ birthday party. But I still just think they are loud and dangerous. Maybe if they had Goldwings here but they don’t. They have Figo’s and these really cheap made in China motorcycles and scooters. They are made of the cheapest plastic you ever did see. The one on the showroom floor in Osman’s had screws missing and decal stickers misplaced and uneven. But I just spent the good part of an entire day getting a license to drive one. Once in Maxara we asked where to go to the drivers license place and I saw my table being made, hours from being finished. We drove down a long bumpy dirt road and as always it feels a bit like a parade. I will never forget the drive out to Ibo Island where a dirt road hours off a paved road became more and more desolate, where the sound of a car brought everyone out of the house and the discovery of white people sent children into high squeals. They always give the thumbs up, we make eye contact and we keep going. I pray this poverty stirs me every time. I want to always be compassionate and always be seeking answers. We drive out to this small painted building, single level, glass windows, several broken. The yard is all dirt but there are rocks in a circle where Mozambican flag is still against a pole. We are told this is the place and we go inside. There are four men there. There is a desk with a notebook and a calculator and a pencil and a few sheets of paper. There is a man with dirty glasses that are crooked on his face. There is a tall thin man with a starched white shirt and a nice smile, the words John Deere in cursive on the collar. There is a tiny little man in a bright yellow golf shirt that hangs almost to his knees, navy pants. A younger man greets us and immediately informs us that the man who we need is not there but he is at home and we can go to his house to get what we need. We don’t want to do that so we ask if they can go and get him. He agrees to this right away, if we pay 50 Mets for him to get the gas necessary to go and get the boss. We are told it is a 20 minute ride away and we realize we are to hunker down for an hour or so. It was longer than that. We sat in this room and talked to the men. They were quite candid and told us that they really never see white people, they asked us if white people married black people. I already knew where this conversation was going. If I had made eye contact I would have gotten four marriage proposals today. They were sweet. They were funny. One guy had been working at that empty office for over 30 years. It is sad that they feel racism, that they have seen a few white people, but never spoken to them. But then again, there are not a lot of white people here TO talk to. We moved out to the porch and lingered, then came inside again. Finally we heard the sound of the motorcycle, where the boy revealed the paperwork without the boss. The men argued over price and we completely got taken for a ride. But we are told that doing this in town takes weeks. This just took most of a day. We paid twice what our friend had paid when he went there. 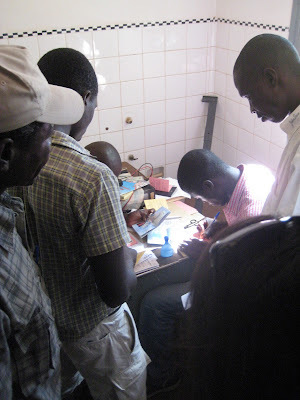 The men were all a buzz in the back office filing out our paperwork and discussing our surnames and saying our names over and over. Cassandra went back to see what was taking so long and insisted I come back to look. The office was a bathroom, turned office. Complete with exposed piping and white tiled walls. Smack in the middle of that bathroom was a large metal military type desk where those four men peered over our Passports and International Driver’s Licenses and tiny color photos we had made in town yesterday. 650 Mets each and almost 3 hours later, we were leaving as fully certified scooter drivers. We then went back into Maxura to get my furniture. The little tables were still wet and he missed a whole lot of spots varnishing them and dirt is mixed in with the varnish, but I took them anyway and didn’t haggle. It is not worth it. They are here in my room now and they are fine. I can touch them up and the look nice and are functional and they work for what I need. The desk remained unfinished but I left promising to come back later. It was about 3:30 at this point and we were all tired and hungry. It could be weeks before I can get a ride back out there and months before I can muster up the patience. We then went into town to find the bikes. We found one in a fabric store, wall to wall capalana fabric and one motorcycle and one scooter, bright yellow. She told us the shop owner would be there tomorrow and could negotiate a price. It had a helmet case on the back that was broken. We found a similar one in another store where I was then sent to a huge warehouse full of cement and paint and thousands of square feet of major building supplies and somewhere in the middle of all that was a cardboard box. The man opened it up and lots of plastic fell out to reveal a burgundy Made in China scooter. $550. It will get me from point A to point B. We are thinking about it. Because of safety reasons, I cannot walk outside of the base alone. All three of us need means to get to one another, to town, to businesses and to the school. I may be a Shopaholic, but I am not an impulse buyer. We may go again to look at them tomorrow. The view as I waited under a Boabab tree on the truck. The boy who insisted on coming with us carried this bag. The view on the way there. The view on the way back. Once on a plane ride, I actually think it was to Mozambique, I read a paperback book titled Confessions of a Shopaholic. I was embarrassed to be reading such a book and wished I could have hidden it underneath War and Peace. But, I was surprised at how good it was and how it made me laugh and how I had done so much of what the girl in the book had done. How she rationalized all her purchases and could “shop” anywhere. She always found something useful, rare, unique or absolutely necessary to buy. Sadly, I am a little like this. So now here I am in northern Mozambique and I am attempting to “shop” for my tiny narrow bedroom. This ain’t Buckhead. But oh what fun I am having and determined to do this well. It is a challenge, it makes shopping way more difficult, new prices, new currency, new terrain, new language. I am in my element. Shopping is shopping. Paris or Pemba. After measuring my room and the space that I had, I realized I was going to have to forgo my sketches (yes, I drew sketches) and reconfigure in my head. I had wanted an L-shaped sofa/bed since my bedroom will also serving as “living” quarters as well. I had torn out furniture pictures from Pottery Barn and Restoration Hardware and Horchow and Ballards, just to give the carpenters here ideas of what I wanted. I found a picture of a bench with cushions and three nooks underneath. I need storage and shelf space. I need places to put things that cannot be hung on the sagging rod in my closet. I bought hooks at Wal-Mart before I came and even drawer pulls at Anthropologie, in anticipation of my new space. I bought a set of 4 basic black hooks for $1.50 and Robin screwed them in my door for necklaces, a straw handbag, my nightgown and snorkel and mask. I found some great straw square baskets for cheap and decided not to do the bedskirt and bought enough to go around the edges of my bed. They are already filled with ibuprofen, sunscreen, insect repellent, and a 6 month supply of toothpaste, shampoo and deodorant. I am still in need of a desk for working and a place to sit other than underneath my mosquito net on my bed. I had asked around and was told there was only one place to go and it was out of town. I went this morning. All I remember is that the destination started with an M, despite the driver telling me more than once. It was kind of far out. I think my left arm got sunburned. There were two places on the side of the road, across the street from one another. There were beds made of heavy wood and thickly stained. All the decorative trim was bulky and a few of the beds came with built in little boxes on the sides with locks! They were huge and hilarious. I overlooked what was on display and searched behind it all at the raw wood, in hopes of something different. I saw an unfinished door that might have made a unique headboard but I really don’t need a headboard. I crossed the street. My friend, Sophia came too. There I found identical, big, stained chunky furniture with drawers that stick. I didn’t ask about the beds but the chest of drawers were about $150. I am hoping my baskets will suffice. Plus, I have such a small space and don’t have room for much. I dug around a little deeper, mostly because we had driven so far and this place was my last and only hope. I would not get to borrow a truck again and this is the only place there is, unless you hire a carpenter and I still had yet to get a number or address or any way to contact one. I spotted a small end table. Unfinished and apparently left outside often. There were leaves and dirt in the compartment underneath and the drawer had no bottom and the back was made of plywood. The remaining wood was rare and unstained. She had potential. There were two. I asked the guy who came over and stood beside me, unsure of what to say to me, but patiently there in case I broke out in Portuguese. And I did. Sorta. I asked if he had more. There were two more, overturned in the dirt, the drawers would not close. Sophia quickly joined the discussion. I tried to share my vision of the bench and told her how I liked the drawers and pulled out my brass Anthropologie knob and she laughed at me. Then we commenced to bargaining and got no where. They would not budge. The promised to fix all three of them and stain them and have them ready in 3 hours. I didn’t have three hours. They were asking a little less then $20 each. They were pretty rubbish, but wood here evidently is expensive and takes a lot of labor to produce. So I have surmised. He will not budge. He ignores my bargaining pleas, just repeating his price and ignoring mine. His persistence won. I agreed to buy all three, with bottoms in the drawers, drawers that close and stained dark brown. Then I pulled out a piece of paper and sketched a desk- yay tall, yay wide, using his tape measure to determine just how many centimeters in would need to be. I sketched a drawer, without pulls, and showed him my pull from my purse. He didn’t laugh but he took it in his hands and looked at it long and hard before handing it back to me. He wanted 1500Mets. I talked him down to 1200. So I am hoping to have a desk custom made for $44 to just fit in the space between my bed and the wall. I plan to use the three end tables in the space at the foot of my bed for a bench, and even brought fabric from home for seat cushions. Now I am on the lookout for foam. And tall vases. And a full length mirror. I can’t wait to see if this all turns out or not and if he is true to his word and does precisely what my broken Portuguese and spot on Charades instructed him to do. I can’t believe I have been here just over a week and I am already a few shades darker than when I came. I have gotten more sun on the past few days than in the last several months. My freckles are blending together and my nose is pink. Today is a Holiday in Mozambique. I don’t have internet enough to Google it, so I am not sure what we are celebrating. The kids do not have school and I can’t go into town to return my broken lamp. I got it at China Dong, or as the kids here say “China” pronounced “Sheeeeeena”. The Sheena Store has the market on everything. It is sad that everything here is imported and, with all due respect, is junk. I paid $11 yesterday for a plastic shelving unit that wouldn’t be fit for the Dollar Tree. It’s Africa. But it is just not right that cheap China goods dominate what there is to buy and that the prices are insane. We need a Plastics company. I had a very productive day yesterday, still settling in and getting things I need from town. Yesterday we went to Nateti or something like that. It is a little section between the base and town where you can buy tools and fabrics and more of a local market, hidden away off the main road in to town. I have been before with my friend Mark, but he made me stay inside the truck and locked the doors. This time I was riding in the bed of the truck, hot African Sun on my Irish freckled skin. Thank goodness I wore long sleeves. I am typing this with light pink knuckles. I jumped out and took surveillance. There were lots of tools, hammers, saws, all poor quality and very expensive. I could use things like this, but plan to borrow from the base. I was told there was a good fabric place at the end of the road. The shops are made of wood and straw and bamboo and thatch. Fabrics for Capalana’s (traditional women’s attire) are draped neatly along the walls. Mozambican fabrics are nice, brightly colored, and often comical. I have seem them with prints of US Dollar Bills, President George Bush, beetle bugs, and more. The fabrics are fun and pretty and rich in color, but not me. I like soft pastels and solids. I scanned them all and found over in the bolts of men’s suit fabrics of grey pinstripes, a pale orange sherbet cotton dress shirt fabric. I want to make a bedskirt. Every bed, no matter the location, needs a skirt. Plus, it will allow for storage of my suitcases and books and duffle bags turned medicine cabinets underneath. I was pleased with my find. Next, I found, and unsuccessfully attempted to bargain for, grass mats. These are used everywhere here. I love them. They are large approximately 3x5 hand tied grass mats used for bedding, lounging, flooring, walls, anything. It is the closest thing I can find to Seagrass flooring. I bought 2 at $3 each. We jumped back in the truck and a drunk guy tried to get in the back of the truck with me. The woman driving slammed on brakes to try to throw him off, but only sent me slapping up against the back of the truck, where I hit my shoulder and the back of my head. I am fine, but for a moment I saw stars. After some yelling in languages neither of us understood, drunk guy took the hint that he was not wanted and let go of the tailgate and was left in our dust. Not speaking the language here is hard. Even though I understand some Portuguese, they speak tribal languages, Makua and Makonde. You really have to pay close attention to other things, peoples faces and body language to determine if they are safe or not. Pay attention and pray. I want to make friends here and want to learn. Mozambicans are so kind and friendly and generous and helpful. I don’t want to offend them by being unkind or trying to protect myself from someone who is just trying to help. Because of this, you have to constantly be on guard, attentive, alert, watching, listening and praying. I don’t like being a novelty. Pemba is growing quite familiar with Westerners, but I still stand out. Some child always yells, Akunha! (white girl) and I know I have been spotted. We stopped again where I was told there were rope beds for sale. There was only one and it was just being finished. A boy, about 12, without an ounce of body fat, pulled on each rope and tied it tightly. He hoisted the bed up over his head and put it into our truck. It later took two of us to unload it. They sold mats there two and I wanted two more. Sue, the Australian visitor, bought them for me! They were 30 cents cheaper. Now I know. We stopped again at the vegetable market where Robin waltzed into the chaos like a pro though having only been once before. She emerged, a good 30 minutes later, with eggplant, tomatoes, cucumber, oranges, and tiny limes. Bananas were also on the list but they wanted too much. We were told to walk away and get them somewhere else. If anyone else is willing to pay that price, the venders stick to their guns, so we have to stick to ours. But it is a huge pain to bargain shop here. Going elsewhere, doesn’t mean just going to the shop next door, it can often be across town, they could be closed, out of what you need, have poor quality and/or be selling the same product for even more. My new theory is: just get it. While the ladies shopped for vegetables, I scorched in the hot African sun protecting my new rope bed. I had lathered my face earlier in Neutrogena 50+, but I could feel my skin getting red hot. I didn’t really get burned but for sure got incredibly hot, most likely a little dehydrated and quickly realized that I will need to do more here to protect myself. I am on the lookout for a straw hat. It makes one wonder, was I made for this? We stopped at a typical little open shop. I don’t know what to call them. Kiosk sounds so modern. But they are little open shops, made of wood, for some reason often painted baby blue inside. The walls are high and full of goods. You can always find matches, detergent, canned goods of various sorts, small not-very-good candies, soap, powdered milk. I bought detergent, a kilo was about $5, and a small bottle of bleach. Then for less than dollar I bought a bag of bread rolls from a boy selling them on the street. They turned out to be a little chewy and I could not help but wonder about this boys’ health score rating. It looked clean enough, maybe an 88? We stopped yet again for me to return that bloomin’ lamp back to Sheena, but they were closed for Siesta or whatever they call it. I don’t know why the Chinese close for the Muslim tradition, unless they too are Muslim or maybe they are just taking advantage of the chance to get a nap in the middle of the afternoon. I would. But I was able to go back to a little open shop where I had seen some of the most pitiful excuse for plastic shelving you have ever seen. I drove a hard bargain and talked him town to $11 (about the same price I paid for the rope bed). I did not want to pay that, but my groceries are in a cardboard box on the floor. I clenched my teeth and put my cheap bright red made in Sheena shelf under my arm and jumped in the back with my new bed and three hours later, we went home. Now, of course, the cardboard box was all sufficient. I have walked through this scenario in my own life and in being among the poor. I have absolutely been guilty of judging Westerners for their extravagant lifestyles, of not using and appreciating what they have and always having to have more and the best. Somehow in this moment of making this purchase, I did ask myself if the cardboard box would suffice. The answer was no. So I got it. I was tired and hungry and thirsty. We put the bed on the porch and it feels glorious. There always seems to be a breeze there and the bed is the perfect place to lounge. Mozambicans here use it to sleep on. Sometimes they cover it with a mat, but it is the traditional way of sleeping, for those who can afford one. I pray mine is still on the porch this morning. I then took all my groceries, overpriced olive oil and other goods and sorted them on my shelf. Robin helped me. We put down the mats on the floor in my room for comfort and texture and they are perfect. I can still smell them. I am just waking up and trying to decide if I want to dip into my real coffee stash or just use Ricoffy, the instant kind that pales in comparison. I already know the answer. I need to ration the good stuff. Last night after dinner we sat out on the rope bed on the porch and Enselmo came over to visit. He is 10. He is my newest friend and a frequent guest. I adore him. The mission school was meeting under the pavilion. We listened in. We walked down further to hear a bit better and heard one of the missionaries from Brasil share about her life there. It was great. She’s amazing. I want to meet her. I need to attempt to get on internet today to send this. I am still huddled under my net, but about to scurry out for instant coffee and instant oatmeal sans bananas. We never found them any where else. Oh well. Perhaps we can get to work on the bedskirt today and you are going to love it. I am too. It is the small things. I just walked out on the porch with my instant coffee and chewy bread roll. The bed is still there but apparently Enselmo etched the letters G and L into the frame. I am going to ring his neck. :) Ok, maybe not. But give him a really good talking to. I will be so excited when I get internet in my house. I have not seem to really find a place on base that works well. I didn’t even attempt to get on yesterday. Perhaps it was the way the wind was blowing this morning but I was able to check my IrisMin Account and got messages from Amy Eaves, Flo, and Carla. My sister sends me all the details from home and they bless my socks off. I hope to get into a routine where I can write you all back and fill you all in with more details on things that are going on. Yesterday I went on a very long early morning walk with a visitor from Australia, Sue. It was nice to have a walking companion and we got a great work out. I can tell that the people here have warmed up much more to Western visitors than when I was first here. In 2007, walking for exercise would have been difficult. It is not a part of their culture and it we drew lots of unwanted attention. Now, we were not that big a deal and everyone just politely greeted us. We walked again this morning and met a family of a young mother with 4 children under 7 coming to Iris for morning church. So we helped her by hoisting two on our backs and brought them all back with us. I dropped my little one off at the church door and ran up to my house to take a shower and came back down for church. Last night I wanted to show Robin one of the best kept secrets of this area. We hitch hiked, much against her will, but the best way to travel around here and got dropped off a little down the road from a small “resort” just off a dirt road near the beach. The minute she saw the view, she forgot about fussing at me about jumping in the back of a truck and in trusting my broken Portuguese to get us safely where we wanted to go. The sun set there and she even cried at the beauty. I almost cried when they brought the full of flavor, variety, oh so delicious food to the table. We had a dinner I will never forget. It has been so good to have a friend here with me. It was nice to have a place to sit and talk and share and analyze and pray and eat. I was for some reason, exhausted after lunch today. I think the weather and all the changes and the move and the travel and everything is catching up with me. I had no energy. It is hot here but nothing like it can be, but still hotter than I guess I am use to. Also, I really have not stopped to have a day of rest in a long time. My final weeks before moving were so full and intense and there are still so many of you who called that I never even had time to call back. I never had even 30 minutes in my days prior to move to just be able to make phone calls or write. I rarely spent more than 2 nights in the same place. I have felt like I have been running a marathon for months now and the race to get here is finally over and I have to stop for a bit and catch my breath. Yet, I did hit the ground running here too. I have made trips into town and had meetings and had kids over and been jumping in the back of flagged down trucks. So I just woke up from a nap. I still haven't swam in the ocean. Cassandra and Steve arrive on Wednesday and I look forward to their arrival. As does my friend Sophia. We met in mission school. She is incredibly creative and artistic. We have had the idea for a long time about setting up a www.etsy.com account with handicrafts, dresses, bags and other things our girls make. Not as much to make money but to teach the girls that they can create their own fashions. The fabrics here are unique and beautiful and could fit in www.anthropologie.com. We just want to see what could come of assisting them in creating something unique. Sophia is Koren and a foodie, more reasons I adore her. I am having to exercise a whole new level of patience with the internet here. I write this from my home and then walk down the hill and pray that I can log on and wait for what seems like an eternity for sites to load. I can’t complain because at least I have some form of communication, however slow it may be. It does seem that my gdavis@irismin.org account or even facebook load faster than my other email. So at the moment, those are the better places to reach me. And now I have DIGITS!! I got my Mozambican phone! Yesterday was full of typical African style accomplishments. I had every intention of going into town but still wanted to get a few of my things from the other base that I left here in April, but don’t have a car so I ran up to a missionary driving away and asked which way she was headed. She graciously took me to the other base, despite being headed in the other direction and then so happened to also be going to mcel. So I accomplished both tasks by simply flagging down the right person at the right time. The country code for Moz is 258, then my number is 824077677. Text or call any time! Well, not any time. I am 6, about to be 7 hours ahead of you, when you “fall back”. If you live in Georgia. Today I am speaking to a small group of mission school students who have enlisted in course on Practical Missions. ME? Seriously? Who’da thunk? I am going to share the vision for the school, for vocational training and talk with the students about their own personal visions for missions and perhaps find a few that might want to help us with what we are doing while they are here for the next 3 months. That meeting is in 20 minutes. I love the wardrobe for meetings here. Back home we have a attire known as Sea Island casual. I reckon here it is Wimbe Beach casual and it is incredibly comfortable, as creative as you want it to be, and fully you, whoever you are, as long as your knees are covered. my hotmail account doesn't work as well as my iris account unless i use the basic html version. all that said, emailing me here seems to work a little better. Yesterday took me back in to town. I had my long list of things I needed. I started the day by attempting to get on the internet. It didn’t happen. I needed to pay a bill online. I am realizing that I can’t rely on it here and Christine has agreed to help me back home. Thank you! I knew that I needed to be pleased with any purchase on my list that I could make and set out to town with a boy named Paul. He greeted us warmly and told us that tomorrow was his birthday. His flip flop was broken. He kindly carried all my purchases and help me find what I needed. I could have done it on my own, but it is hard to resist their eagerness to help. I stood out and felt like a missionary in my below the knee skirt, Mary Jane tennis shoes, blouse and the black Jansport backpack I had in college. I would not be caught dead wearing that anywhere else. There are a few large Chinese ran shops in town. These are the Wal-Mart’s of Pemba. They sell everything, at a lower price, in mass quantities. Dad, they had all those products you can find on Meritline.com, incredibly cheap, horribly packaged, USB port fans, calculators and all sorts of the most poorly made products you have ever seen in one place. However, they are all we have and the only place to buy some of them and they are all in one place. I bought a lamp (that didn’t work), lightbulbs, a mirror, and an outlet strip with a surge protector. The line was not long at all for mcel so I went right in and bought the cheapest phone they had. It was about $34. It’s so old school. I love it. However, if I have to register my sim card. This means I have to take my passport there and fill out a poorly photocopied piece of paper with my information before my phone will work. Which means I have to go back again today. I actually made two trips into town yesterday. Paul’s shoe was fixed on the second round. I found pickled beets. I think the jar cost $6. I will ration them. The weather here is still really nice. It is not so miserably hot and there is a breeze. This is a huge blessing. The mission and pastors schools had church last night and that was wonderful and glorious. Laura, I got your email. I will write soon. Many thanks to all of you. I feel your prayers. I had made a long list of things to do yesterday, really none of them got done. Not a bad thing. Just the facts. It woke up at 7:30 and had to make myself get out of bed. It is not really all that hot here but I still wake with my hair plastered to my neck and my skin moist with sweat. And I still wake not yet knowing quite where I am. We have a mosque in our backyard. It is actually way up on the hill behind the property but when the blaring prayers and chants and whatnot come garbled across the speaker system, they wake me. Heidi spoke in the school so I went to listen. She spoke about not worrying about what the vechicle looked like but rather what will move you. Don’t worry about the boat but what will feed the sails. (Carson and Gracie, there is a lizard on my wall as I write this to you. When I overcome my phobia I will catch one and bring it to you. He has moved up to the ceiling now and I fear he will drop on my head, or in my coffee). So Heidi’s message rang true in my own life as I try to get my head around a school and all that involves and these kids and Portuguese and curriculum and instructors and courses. I need to just rest in knowing the One who sent me and fill up daily with His goodness, kindness, strength, wisdom, patience and so much more, and the rest will come. I then went to lunch (rice and beans) and then bummed a ride with a truck full of visitors into town. Food here is an issue, at least for me. It is hard to describe the grocery store. Well, not really. Imagine a gas station on the way to South Georgia. Imagine going inside where the lights are off. Imagine buying what little canned goods, packaged meats and other packaged items they have for sale at twice or maybe even three times the value. Then imagine it smells like toilet cleaner, those cheap ones you hang over the side that come in Strawberry scent. Then imagine a dozen black men outside the gas station, putting withered produced in your face and asking you to pay Whole Foods prices in a language you kinda, sorta, don’t really understand. And there you go. Not judging, just giving you my observation. So I lumbered into this quaint little town that I truly dearly love with the intention of buying a phone and groceries. The mcel phone store was packed with people even waiting outside. I have waiting in line in Pemba before and I knew I simply did not have the patience to do it yesterday. I had so many other things I needed, like food to eat and that was a priority over standing in line for the next two hours to get a phone. I have an unlocked one from the States coming to me in January, but will get one for now when I can get back into town. I went up to the Supermercado, the one where the owner guy who works there looks like the guy on Aladdin. He was waiting outside and I knew they would be closed until 3. It was 2:58. I went into the bread shop and bought 3 rolls and a small carton of peach juice. I sipped the juice through the tiny straw as I waited on the shop owner to awaken from his siesta and open the market. By 5 minutes after I decided to just go buy vegetables. I had actually missed the venders a little and actually walked away quite proud. My lessons are paying off, or maybe it is just because I have been here 4 times now and know the routine. Either way I walked away with limes, tomatoes, and cucumber. We then jumped in the back of the truck and went to Osman’s. Osman’s is the second grocery store in town. Square footage-wise it is bigger and they do turn on the lights, but it is no different than Aladdin’s. The prices there are crazy insane way too much. I bought napkins, instant oatmeal, whole wheat pasta, a can of chickpeas, two cans of tomatoes, two cans of tonic water, peanut butter, a can of tuna, a small bottle of apple cider vinegar, milk, cheese, butter and I think that was $50. I am going to have to come up with a method. A plan. A menu. At a small shop I got some eggs. I jumped back in the back of the truck and came home with my stash. really no words to describe today. i harshly describe it as being punched in the face. reeling from the vast differences in culture and the fact that i am here today. very much my desire, but so very different from the life i had just days ago. i am anxious to be busy and full of activity and to make friends. no man is an island. the flight was not emotional or sad or even exciting other than all the hours prior saying goodbye. it just full of God’s grace and i just seemed to think about the frozen meal in front of me and the next movie i was going to watch as i counted down the 15.5 hours to johannesburg, never fully focusing on the reality of what i was about to do. just sitting dutifully in seat 41J. i arrived here yesterday and immediately started to unpack and get settled in my room. it is a small space but brand new and nice and tidy and cleanliness is a greater blessing than space any day. AND i have a view of the ocean. it is a massive blessing. i don’t have a chest of drawers or a rod in the closet so unpacking was a little pointless but i did it anyway. i have a low wooden twin bed and a large grass rug. i brought a soft yellow striped curtain i got at pottery barn in 1997 and have never used and hung it to cover the closet, it fits perfectly. my roommate tanya very graciously had put a three tiered made in china plastic shelf in the bathroom for me to sort my overstocked toiletries. robin stepped right in and helped me unpack and measure and determine what items i would need to organize the 6x12 room. i found my sheets in the bottom of my backpack that laura gave me, and made up my bed. i stuffed the cluster of pink silk dahlias i had splurged on in my green Wellies in the corner of the room for lack of a vase. i stacked my empty journals and assortment of Portuguese dictionaries, Bible and a hardback book by my bed. laura, the neighbor came over and invited me to a birthday dinner celebration for the ministry director, Rolland. transportation here makes me feel like i am a contestant on Survivor, you must make alliances or else you will not survive. i don’t have a car and i have to rely on the kindness of missionaries who do. i found a friend who graciously agreed to take me to the party. we bound down the familiar road to the Baker’s house and i found myself a little shocked at how normal it all began to feel so right away. i walked into the party and was hugged tightly around the waist by Olga, an 11 year old girl who lives at our center. Olga befriended me when i came here considering coming full-time back in 2009. if you got my Christmas card, she was on it. we spent days cooking, coloring, playing cards, singing, dancing, walking on the beach. we hung out. i spoke about two words of Portuguese at the time and even spoke those two quite poorly. i was actually able to talk to her in Portuguese and ask how she was doing and tell her that i was here to stay and for the first time was proud of myself for enduring all those weeks of those horrid Portuguese lessons. a few other missionaries shouted, “here comes the newbie” and i was welcomed by my new family. we sang Happy Birthday Mozambican style to Papa Rolland, with praying and singing and then Heidi thanked Jesus for the food, for Papa Rolland and for sending me to them. i thanked Him too. Olga saved me a seat and handed me a warm bottled soda and we ate our rice and cabbage together and made plans to get together on Saturday. i can’t wait. i fell fast asleep and was awakened by my neighbor Zelinha calling my name. my maid had arrived and i was dead to the world. i had no clue where i was or who i was. i woke from such deep sleep and have been in so many places for the last few months that i was completely disoriented. Zula came and cleaned the house and did my laundry. (thank you May and Fay). Robin and i walked down to the beach and soaked in the beauty of the Indian Ocean. i walked down the hill and was able to get on the internet but it is as slow as i feared it would be. Iris had a special event tonight with the kids, handing out new shirts and ice cream to all the kids. ice cream is a rare treat that the kids usually only get once a year, at Christmas. they all got hugs and kisses and temporary tattoos. now i am back in my little room. the light is out and i have the solar lights Dad bought me charged up illuminating my bed as i write you. they both just went out the second i wrote about them. oh well. they worked perfectly last night and i was excited to be able to use them as a night light. the weather is unseasonably cool, with a breeze. wondering just what tomorrow may bring. well, technically it is day three. it is 3:00AM and i am wide away. that breeze i wrote about went away and the electricity went off. without a fan blowing, i am hot and unable to sleep. there are dogs barking in the distance and an occasional rooster crows but for the most part it is silent. the air is still. i have been spoiled by atlanta’s pre-fall weather. this is nothing. it is going to get much, much hotter. i took a melatonin and am waiting on it to kick in. i was wide awake talking to all of you in my head anyway so i decided to just get up and come here and wait out the insomnia. i made a list of things i needed to do today. they all seem like mundane tasks and would not fill an hour in my previous life, but here things seem to take longer. communication is difficult, i am new and this is Africa. rolling with the punches is an understatement. at the moment, i need silly things, like the screen on my windows replaced. they were slashed and now i am fully exposed to the elements, and by elements i mean malaria ridden mosquitos. also, my net is in storage on the other base. i brought one when i was here in April and left it in storage. i need to find the guy with the key. and i want to get a rod for the closet installed so that i can gather all these little piles of clothes off the floor and tidy my room. i also will need to do a little Admin. Gena Cauthen has found us more technical training curriculum! even though i assume it will be in English, it could be vital to instructors and our visitors and missionaries coming to teach various skills training. i want to introduce her to our curriculum director, Travis so that they can coordinate getting the curriculum here and determining what we need here. that is going to be half the battle, determining what training will be most effective and needed here in this culture. and then i want to make curtains. robin is a curtain expert and has agreed to lead this project. i can’t wait! for now i am apparently jet lagged and hungry and have not been to town to get groceries. i have 13 granola bars in my possession. i don’t want to waste one. i should be sleeping. now someone is yelling or chanting in the distance and dogs are barking. it is still way quieter than Atlanta ever was. someone is walking outside my window. i think it is a guard. i hope. he had on shoes. you could tell. the electricity must have come back on in town as i hear the chanting from the mosque. something is burning outside. must find sleep. i arrived yesterday afternoon. my new home is beautiful and clean and tidy and neat and has an ocean view. i was greeted by my sweet little friend Olga, who is 11 and has no idea that she is one of the reasons i am here. now i am just in the process of unpacking and finding a carpenter to make furniture for my room and getting settled in my new space and getting a rod hung in my closet to hang clothes. i am going to speak to a group of mission school students on friday and share the vision for the vocational school and talk to them about their interests and where they could possibly serve to help us. the weather is unseasonably cool and there is a great breeze. i am anxious to have lots to do but trying to take it one day at a time and rest a bit as i adjust to this very new place. thank you all for all you have done to get me here. i am honored to be in this place and could not have done it without you. even to the greatest details, wanda, these keen's are wonderful as is this little black skirt i am wearing. christine, i smell like tea tree shampoo. shannon, i love my feather pillow. kim, my hair smells like prell. i am blessed beyond measure. i love you all and am undone that i get this chance. to be here. to do this. you have all taught me and showed me how to love. i am so blessed i get to come here and give it away.